Twenty years ago, the British/South Asian comedy show, Goodness Gracious Me ran a skit where a British employee at an Indian firm needed to change his name from ‘Jonathan’ because it was deemed too ‘foreign’ and hard to pronounce. Behind the parody was the fact that South Asians in Britain felt they needed to adopt English names to succeed. At that time, globalization was seen as resulting in increasing influence of Western culture and ideas across the globe. The East needed to adapt to the West. Twenty years later, after a global financial crisis, that power equation has shifted. Now a young British MBA seeking success in India’s Tata Consulting Services, for example, may not need to change his name, but he certainly needs to be conscious that his ethnic culture is not the dominant one. Those working in Canada’s resource sector have long been conscious of the East’s power, (specifically China) as their fortunes are often tied to it. For many of us working in Canada’s marketing services however, this idea has been more abstract. That is, until the reality of our global situation was brought into sharp focus by the recent acquisition of Cossette Communications’ parent company by China’s BlueFocus Communications. The symbolism of a Chinese company buying one of Canada’s oldest advertising agencies is startling in itself and will almost certainly be seen as yet another example of China’s growing influence on business in Canada. To understand the practical implications of this acquisition though, we’ve taken a closer look at this case study with a particular interest in those directly involved in this new partnership. Instead, we’d like to focus on ethnic cultural differences, as these companies are coming from two countries whose ethnic culture differs across a range of dimensions. On top of that, “ethnic culture” is likely of particular importance to this case, as culture is much closer to the centre of the advertising and communications industry than it is to other businesses. It is embedded in their products. There are numerous models of cultural differences that exist. 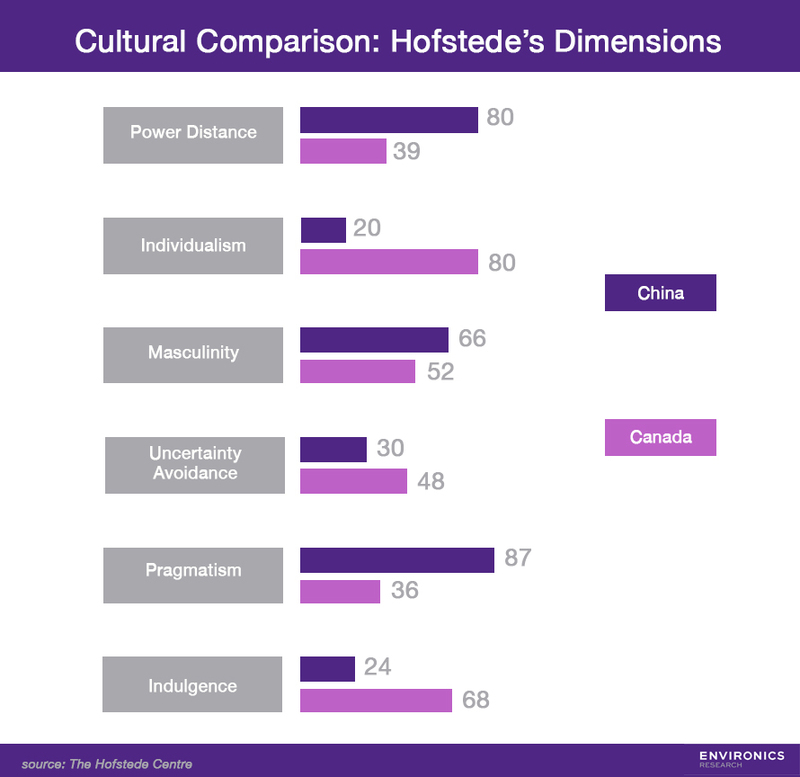 In fact, our own research at Environics has shown the differences between Chinese and Canadian culture, but in this case, we’d like to use one of the most established models, Hofstede’s six primary dimensions, to speculate about how the Chinese ethnic culture of BlueFocus’ management may have an impact on the partnership of BlueFocus and Cossette. The chart above shows the gaps between China and Canada on Hofstede’s dimensions of Individualism and Power-distance, but let’s take a look at the Pragmatism dimension. Hofstede says that “In societies with a pragmatic orientation, people believe that truth depends very much on situation, context and time. They show an ability to adapt traditions easily to changed conditions”. The data shows Chinese much higher on this dimension than Canadians, which can be seen in the current Chinese business environment. Many in the West attribute China’s manufacturing success to low costs, especially of labour, but that is not all that lies behind Chinese manufacturers’ ability to shift very quickly depending on their circumstances. The ability of Chinese manufacturers to respond quickly to Steve Job’s sudden demand for an unscratchable glass iPhone screen has become part of business lore. Behind this agility are a number of factors and important among them is the Chinese position on the pragmatic cultural dimension. So what will the introduction of Chinese pragmatism and agility mean to Cossette and Canadian business? Generally, a result of this cultural characteristic is the perspective that each situation needs to be evaluated independently from accepted rules. Just because one rule has worked in the past doesn’t mean it should apply now. Cossette employees should expect that some of the ‘best practices’ that they cherish may not be considered relevant in all situations. This can be a painful process, especially for people who are used to calling the shots. It can even raise complaints about lack of integrity or at least fairness, just as I am sure some of the American manufacturers who watched their Chinese competitors pivot to produce iphone glass screens thought – that’s not fair, they’re not following the rules. That is not to imply that BlueFocus is not interested in learning and, if appropriate, following the best practices that Cossette has developed over its long history. We are not implying that the norms, standards and legacies that Cossette have developed will be jettisoned or even overtly questioned. We are sure they will see them as a great asset, but the perspective on how they should be applied is likely to be different. They are much more likely to be applied as “fit to purpose” solutions. This is where we suspect we will find the seeds of progress that the interaction between these two cultures create; the leveraging of best practices developed over years of experience in an agile manner. Not that this will be easy, but it may be easier if indeed BlueFocus overtly challenged Canadian practices, though they say that is very unlikely. That’s not the Chinese way! The tensions will come from subtle interactions and the people involved will have to navigate that. The fact that BlueFocus has been born into a highly dynamic market without the legacies of established advertising companies like Cossette will likely contribute to their “pragmatic” cultural character as well as their ethnicity. They can embrace new approaches more easily without the pain of wrestling with the past – just as consumers in developing markets have “leap frogged” the West in adoption of mobile and digital technologies. BlueFocus’s rather broad positioning as a “brand management solutions” provider and their easy embrace of digital is testament to this. They can address the complexity of the communications business from a position of having been born into it. Again, this fresh perspective when combined with the experience of Cossette will be where progress lies. There is no doubt that regardless of corporate culture, ethnic cultural differences will be present in the way that BlueFocus and Cossette do business. These can be messy experiences, often involving small or even major conflicts and a lack of communication or understanding. But this is where we find the fertile soil for progress. Cultural differences, if understood and managed well, are seeds to progress. That’s what we call transcultural competence. Transcultural competence has abundant applications from leadership styles to client-agency relationships. If nothing else it will ease the pain points. But more than that, it can also make the difference between failure and the success that this fertile ground has to offer. We wish BlueFocus-Cossette well and hope it will be a case study not only showcasing the growing global scope of Chinese companies but also the power of transcultural competence.